Tom Brady and Peyton Manning are perhaps the two greatest quarterbacks of all time. They are living legends who have come to embody the quarterback position and shape an entire generation of the NFL. They have also been fierce rivals every step of the way, and their many epic duels have not only ranked among the best and most exciting games ever played; they have fundamentally shaped the lives of and careers of both men. But until now, there has never been a definitive account of this rivalry-one that tells the real story. What do Tom and Peyton actually think of each other? What do their coaches think of them? What about teammates and opposing players? What are they like behind closed doors and in the locker room? How did their vastly different upbringings shape them, and how has each handled the injuries, setbacks, and defeats they've dealt with over their careers? 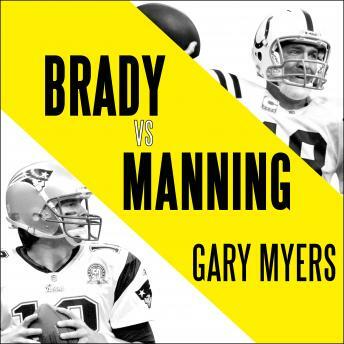 In this extraordinary book, veteran NFL correspondent Gary Myers tackles this subject from every angle and with unprecedented access and insight, drawing on a huge number of never-before-heard interviews with Brady and Manning, their coaches, their families, and those who have played with them and against them.